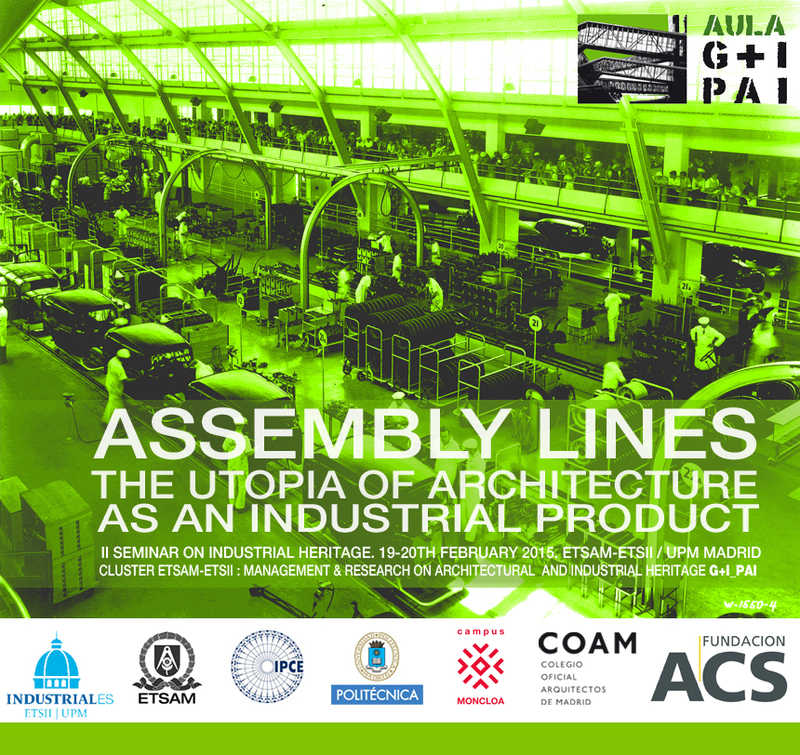 The ETSAM-ETSII Cluster G+I_PAI –Management and Intervention on Architectural and Industrial Heritage– wants to join the campaign for the “European Industrial & Technical Heritage Year” proposed by several European Organizations for Industrial Heritage for the year 2015; therefore, the Seminar’s organizing committee has considered appropriate and convenient to bring the question to our annual Seminar in order to cooperate explicitly in this campaign. That is the reason to postpone the announced II Seminar (initially planed for November, 2014) to the next year, 2015, on February, the19th & 20th, and consequently adjusting the calendar for submission of abstracts and articles. The II Seminar’s theme proposed by the G+I_PAI Cluster (Technical University of Madrid) prompts a question of undeniable scientific interest, while positioning itself in a area of unquestionable opportunity. Even when there are well-known experiences prior to the Industrial Revolution –as the manufacturing procedures used in Venetian’s Arsenal– the Assembly Line production system is related to the beginning of the Industrial Revolution at the end of XVIII thC., being first applied in military and arms industry, then later transferred to textile industry and others. 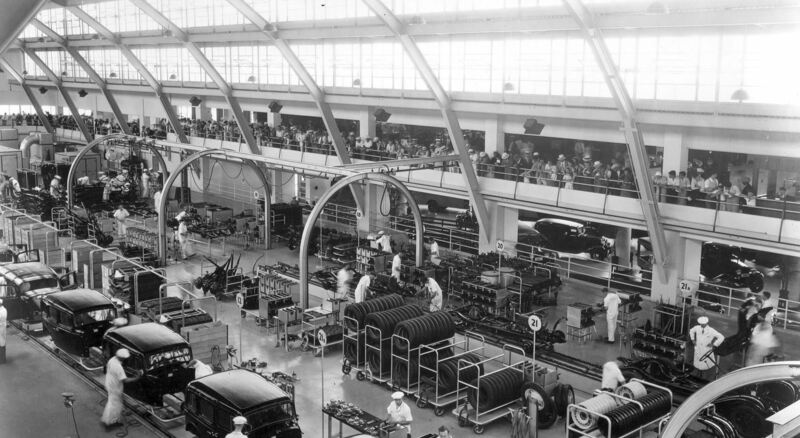 A hundred years ago, the firsts assembly lines were set in Ford’s car factories while pioneers such as Richard Buckminster Fuller, Walter Gropius, Le Corbusier or Jean Prouvé set their eyes on new methods of production. This interest on industrial processes and their possible applications in Architecture has been kept alive trough a series of architects all along the last century ant still today is a distinctive sign of modernity. To evaluate the political economic or social impact –as well as their historical & cultural contexts– ; the impact of industrialization on Architecture, its projects and realizations, its strategical alliances; to set on the table the quoted “Foucault’s archaeology” of unrealized — or half done– projects and experiences; to know the universe of patent systems, products and production processes linked to specific production spaces and the auxiliary industry; the mutual approaches between Architecture and Industry; the review of all its implications from the point of view of Architecture’s classical principles and, finally, to see how all these changes affected our countries, landscapes and ways of living /building, their efforts and failures; all these issues show a more than enough justification for the proposed theme. A recent exhibition in Paris, under the title “Architecture en Uniforme / Projeter et construire pour la Seconde Guerre Mondiale“, held in a renowned institution such as the “Cité du Patrimoine et de l’Architecture” proves the current interest on the theme: doubtless, war-times force and speed-up experiences in that field, looking for a necessary efficiency. Political, social & economic impact. Historical & cultural contexts. Impact on Architecture. Utopia in projects and realizations. Products, patents and processes. Machine – enveloping as a part of process auxiliary industry. Invention and innovations: Approaches & links between Architecture and Industry. Organizing of Production and standardization. Case studies. Experiences in Spanish /European context. For the previous acceptance of presentations, an abstract should be sent under the following rules: 500 words max., font: Arial 11 pt., and at least, five keywords. Languages: the abstract can be written in Spanish and English (500 words each) or English. All proposals will run under a two stage scientific selection process, the first selection will be made on received abstracts, the second and definite on the articles; all selected works will be presented by the authors, and published in the seminar proceedings (for articles, see template below). * Application form, duly completed. * Students: justification or any proof of such status. Once the payment made, cancellations for justified reasons could produce fee reimbursements. Applications for reimbursement must be addressed to the seminar’s direction (official e-mail address), including an explanation of the reasons for the cancellation. The reimbursement will be made once the seminar is finished, and after discounting bank charges.